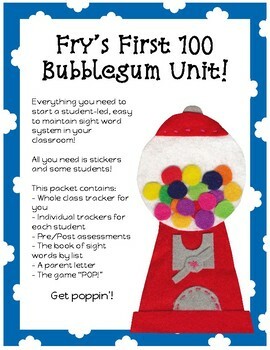 Bubble Up with Fry's Sight Words First 100! 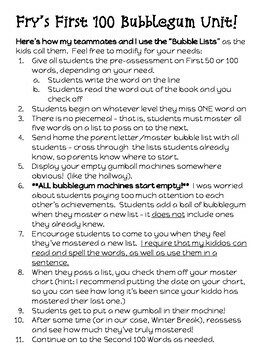 This year my school asked us to concentrate some time on tracking sight word fluency. We put it off for a short while because, honestly, all we received by way of advice was the list of the First 100 words. It seemed like a really daunting task! Finally, I turned to Pinspiration! The bubblegum unit idea came from there, but the materials and system are my creation. 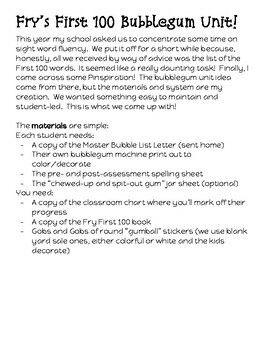 We wanted something easy to maintain and student-led. This is what we came up with! This file is the first half of our Fry’s packets with the same bubblegum theme. You get all of these materials (except the stickers), as well as a sight word game called "Pop!" 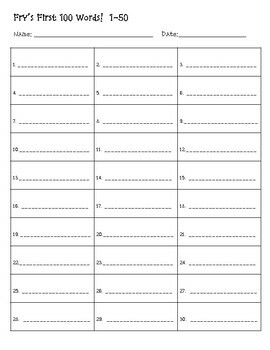 for small group or centers time! You can also use the word cards for flashcards or print two copies for a memory game!